Who was Captain Swing And What did the name symbolise or represent? Answer: Captain Swing was a mythical person. During the riots to destroy threshing machines and farmhouses, the letters left by the rioters carried the signature of Captain Swing. The name symbolized the protest of poor against the rich farmers and against the new technology. This article is about the threatening letters of the Swing Riots. "Captain Swing" was the name appended to several threatening letters during the rural English Swing Riots of 1830, when laborers rioted over the introduction of new threshing machines and the loss of their livelihoods. 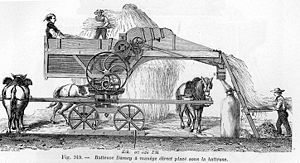 Captain Swing was described as a hard-working tenant farmer driven to destitution and despair by social and political change in the early nineteenth century.